The Broadcast Film Critics Association (BFCA) and Broadcast Television Journalists Association (BTJA) have a star-studded line-up set to present awards at the “22nd Annual Critics’ Choice Awards.” Those slated to take the stage include Shiri Appleby, Amy Adams, Anthony Anderson, Rachel Bloom, Sterling K. Brown, Kylie Bunbury, Ty Burrell, Lily Collins, Common, Clayne Crawford, Kaley Cuoco, Bryce Dallas Howard, Walton Goggins, Cuba Gooding Jr., Kevin Hart, Nicole Kidman, Nia Long, Leslie Mann, James Marsden, Michelle Monaghan, Jim Parsons, Norman Reedus, Jeremy Renner, Bella Thorne, Justin Timberlake, Milo Ventimiglia, Damon Wayans, Katheryn Winnick, Constance Wu, Steven Yeun, Constance Zimmer, and more. at the star-studded Critics’ Choice Awards gala, which will be broadcast from the Barker Hangar in Santa Monica on A&E on Sunday, December 11 at 8PM ET/ 5PM PT. The awards broadcast will immediately follow the “Critics’ Choice Red Carpet Live” on A&E. 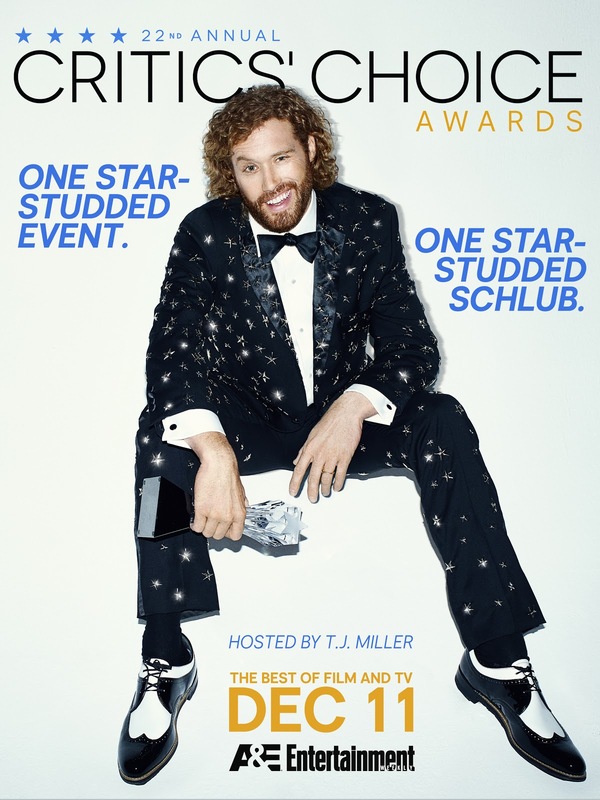 As previously announced, actor and comedian T.J. Miller will serve as the show’s host. “The Critics’ Choice Awards” are bestowed annually by the BFCA and BTJA to honor the finest in cinematic and television achievement. The BFCA is the largest film critics' organization in the United States and Canada, representing more than 300 television, radio and online critics. BFCA members are the primary source of information for today's film-going public. BTJA is the collective voice of almost 100 journalists who regularly cover television for TV viewers, radio listeners and online audiences. Historically, the “Critics’ Choice Awards” are the most accurate predictor of the Academy Award nominations.